All right, pilgrim. It's time to load up the ol' saddle bag and relive the West all over again. You'll notice that I'm swaggering from a bullet wound to my left leg (and not banging it into the wall in the bathroom walking out of it- I don't care what my housemaid says). So time to grab yourself a copy of Gun Showdown and see what it can do for you. The game is a port of last year's Neversoft/Activision console release, but has a little more going for it that makes it right a little higher in the seat. The game puts you in control of this cowboy named Colton, who merely wants to live out his days in peace. He enjoys hunting with his father and living the good life. But all good things...well, you know the rest. While the two are riding on a steamboat, they find it's been taken over by a group of bloody mercenaries, led by a dangerous preacher on a search for a golden cross. Colton has no choice but to get involved when his father is left for dead aboard the boat, and begins the quest for this cross. It seems more powerful higher-ups are involved to get it, pilgrim. The main game is pretty much the exact same as the original console version, complete with many tasks like robbing a train, shooting down Indians that want nothing more than to stop town development, free-roaming to find new tasks to complete, and, my personal favorite, horseback riding. Neversoft developed a great horseback riding engine last year, making it feel just like it should in a video game, and Rebellion has captured that same feeling nicely for the PSP. A man's gotta trust his horse sometimes- because he can't ride his wife out of town, now can he? Anyway, back to the game. The control scheme takes some getting used to because you have to use the D-pad in order to activate the Quick Draw mode, which is where the game slows down and zooms into first-person to give you the ability to shoot enemies and items more accurately. 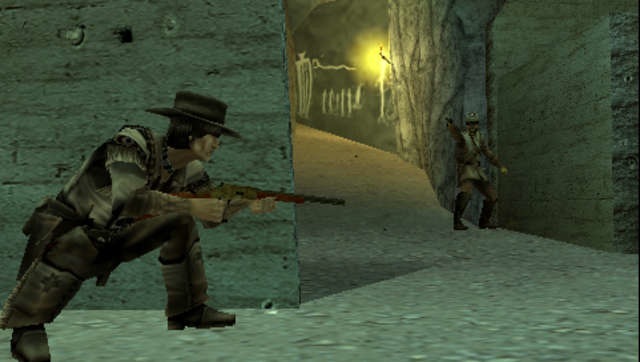 Quick Draw is a load of fun, but those used to just pushing a button will have to adjust to the PSP control set-up. It's still great, though, fella. The presentation in the game is accurately ported over from the console version. 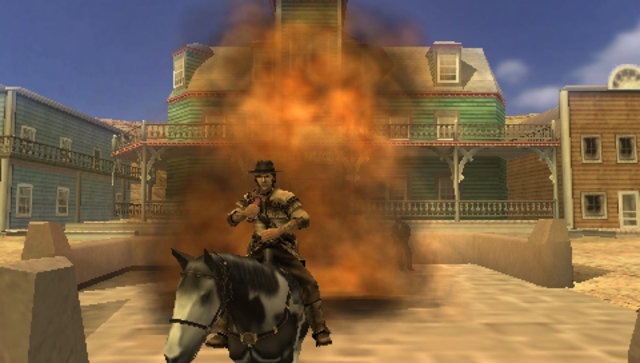 The graphics are very good, effectively putting the old West right into the PSP. Some townsfolk are missing from the free-roaming levels in the game, which is weird, but it still looks like the real thing and not some facsimile...like that damn Blazing Saddles movie. Fake towns piss me off. With sound, there's a full voice cast at work here, including Thomas Jane, Kris Kristofferson, and my personal favorite, Lance Henriksen as the ultimate bad guy. They all do an excellent job here, filling their characters with just the right level of emotion. So the gameplay's pretty good, and the presentation is right on. But one other thing that needs to be discussed is longevity. The main game itself can be beaten in a matter of hours, but there are extra sub-missions to complete, such as bank robberies and bounty huntings, that will keep solo players busy. There's also various multiplayer games, where players can hook up via AdHoc and challenge each other to such games as Texas Hold 'Em and shootouts. These games are more fun than you'd think, and are worth hooking up with others in if you can find a person who owns a game in the local neighborhood. So that sums it up, pilgrim. If you have a fascination with the Old West or even remotely liked last year's release of Gun, then Gun Showdown should be added almost immediately to your game collection. Its gameplay is still riveting and awfully bloody, just the way I like it, and the presentation has been handled well. Grab yourself a dusty hat and hit the trails. Hey, what the hell just happened? What's Hot: Great multiplayer games; terrific presentation brings the West to life; Quick Draw rocks. What's Not: Controls take some getting used to due to the PSP format; main game's too short.